I don't watch many TV shows, though I have particular ones I do make a point of seeing. (Torchwood, Doctor Who, CSI with Lawrence Fishburne, etc). But when I saw the picture at the top of your post, I almost screamed, "If they cancel that show I'll break someone's teeth!!" Ahem. Nice to know it's coming back. Hi, Valerie! I am a former Today blogger (Being Bipolar). I added you to my blogroll of former Today blogs. @Phyl--LOL, I'll let them know they better not cancel The Mentalist. 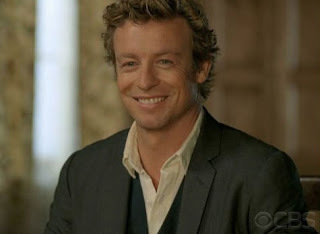 Seriously, lookit that gorgeous Simon Baker smile? Who could cancel *that*?? Doctor Who and Torchwood rule!! @MM--I've only seen the first 8 or 9 epis of Bones this season but they seemed like they were starting to jump the shark there. It was rumored they might get the ax, but I think the ratings must still be pretty high. I hope they can get back on track with it. I got the *same* feeling you did about Chuck. They might be doing it like Life--working up to an ending people can live with if it's cancelled, but leaving it open enough for another season if they get one. I *wondered* why stupid The Unusuals was on two nights in a row. GAH. I read that Cupid was only being preempted one week, so hopefully they haven't given up on that one yet. I saw a couple episodes of Dollhouse and really didn't care for it. It just didn't feel like a true Whedon show. Some people like it, but I think they're giving it a healthy dose of benefit of the doubt just because it's Joss. @Atorturedsoul--thanks for the add! I'll put you on mine as well, and thanks for stopping by! While Cupid has been prempted, Eleventh Hour seems ot have been replaced. WTF?!? @MM--Yeah, I guess the stuff with Zack started last season. That was definitely a big dramatic moment no one saw coming, but as for how it's affected the show? Gah. They dismantled a lot of the charm of the character dynamic and that was a big mistake. Plus the Angela/Hodgins thing got so stupidly messed up. I think they went totally the wrong way on that. I don't think Cupid is going to make next season, so I'm just trying to enjoy it while it's here. From what I just read, Eleventh Hour hangs in the balance depending on whether CBS keeps pricey dramas Cold Case and Without a Trace. I only watched a couple episodes of Dollhouse, and to me, Eliza being "hot" was about all she "could" do. People seem to have enjoyed her in other things, but I think she's way out of her depth here. Latest word from tv.com, though, is that Dollhouse might come back next season.